Now the cat is out of the bag. Di and I surprised our mother by flying down to The Villages (Florida) yesterday. We really surprised them too. We've been to The Villages twice before but never during the winter. It gets crowded. Lots of old people and lots of grand kids. 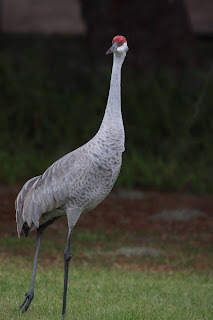 We got to see some pretty cool birds in our 24 hour stay. 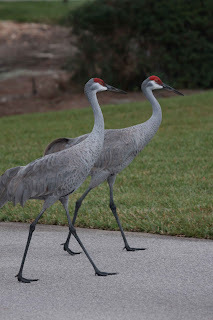 Here are some photos of the Sandhill Cranes that make their home at The Villages. These two were unphased by all of the people riding by in golf carts. They strolled right across the golf cart path as if they were alone. We also found Buffleheads, Ring-neck Ducks, Pie-billed Grebes, several Herons and Egrets, Ibis, Woodstorks, Killdeer, Cormorants, and tons of Coots. 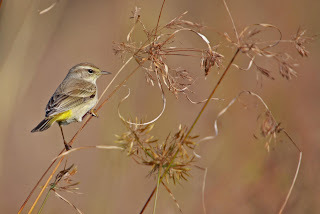 Di took a great photo of Palm Warbler that landed several yards away from us while we were trying (unsuccessfully) to take photos of the Bufflehead. Here is it. What a great photo! I don't know why Bufflehead are so hard to photograph, but I never seem to be able to get a good shot. It must be the iridescent coloring against the bright white of the head. I'll keep trying. On to Punta Gorda with friends. Hopefully, we'll get some more good birding. Stay tuned. . .